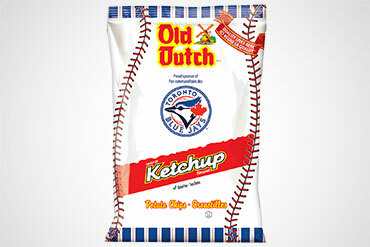 Old Dutch knows how important baseball is to Canadians and the strong following the Toronto Blue Jays have across the country. "We are thrilled to announce our sponsorship of the baseball team. It’s truly exciting to be the official potato chip of the Toronto Blue Jays and Rogers Centre™. We are looking forward to having fans and consumers make us a delicious part of their game while watching the Jays take the field," said Scott Kelemen, National Director of Marketing, Old Dutch Foods Ltd.
"This sponsorship agreement has given us the opportunity to provide consumers with exciting and unique experiences as well as a quality product to enjoy at the game or to share while watching at home," said Kelemen. Covering all the bases, Old Dutch will be introducing ‘Canada’s Perfect Lineup’ with co-branded bags of Old Dutch potato chips and an exciting national consumer contest. "Canada’s only Major League Baseball team is proud to be partnered with another great Canadian company to bring fans a quality product at the stadium or at home as well as a national contest that connects our fans with the Blue Jays from coast-to-coast," said Mark Ditmars, Vice President, Corporate Partnerships for the Toronto Blue Jays. More information about the National Contest will be released shortly and available at your local grocery and convenience stores. Two Canadian brands, two quality products; Canada’s Perfect Lineup! About Old Dutch Foods Ltd. It all started in Winnipeg in 1954. Taste, quality, and identity made such an impression that Old Dutch chips and snacks were an instant hit. Six decades later, our windmill is now a sought out fixture on store shelves all across Canada. A brand to trust, a product to enjoy - Old Dutch continues to lead the snack industry in product innovation and integrity.